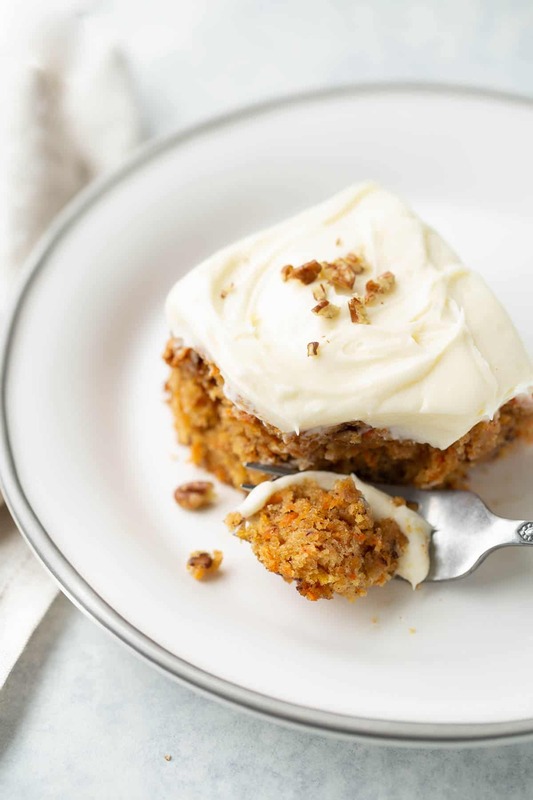 Hands down the best gluten-free carrot cake around! 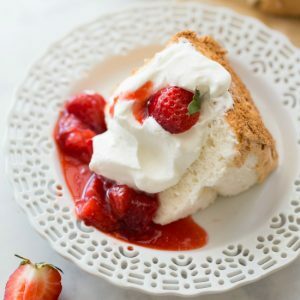 Easy to make with everyday ingredients and topped with a blanket of fluffy cream cheese frosting. Nobody will guess this is gluten-free! Easter dinner isn’t complete without a delicious carrot cake for dessert! 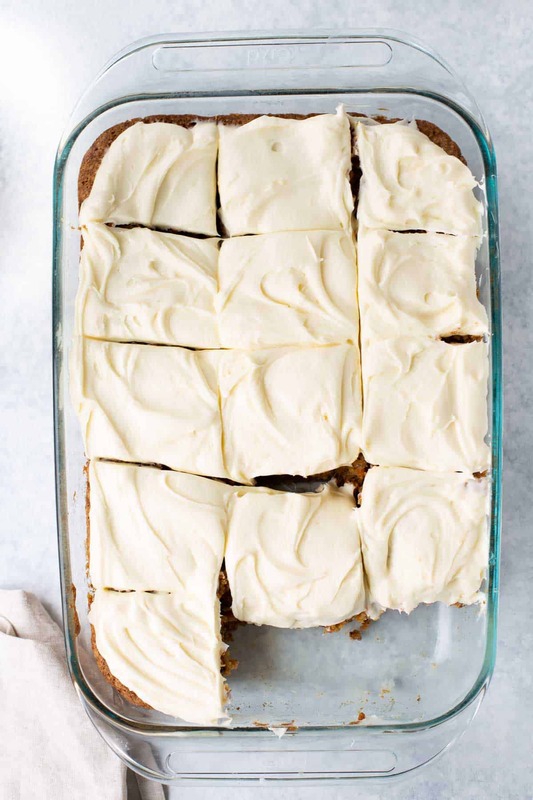 I’ve been making this carrot sheet cake for a few years now and it’s always an unbelievable hit. It is light and moist with the perfect tender crumb and hint of spice. The cream cheese frosting is just the right amount of sweet. It’s whipped until it’s fluffy so it makes a blanket of frosting over the cake. Nobody will guess this carrot cake is gluten-free! I love how easy it is to make sheet cakes! No stacking layers precariously with frosting. No worrying it will tip over on the car ride over to a friends house. Just easy-peasy cake made in a 9×13 pan that is no-fuss, portable and always a crowd-pleaser. 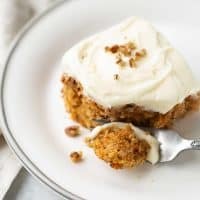 This carrot cake is surprisingly easy to make- it’s no different than making a regular carrot sheet cake! The ingredients are basically the same (eggs, sugar, oil, carrots, spices, etc.) except you use gluten-free 1:1 baking flour. This is also sometimes called measure-for-measure flour. Just be sure to pick a flour that contains xanthan gum that acts as a binder. I like using King Arthur Flour Gluten-Free Measure-For-Measure Flour and a little bit of almond flour for the dry ingredients in this recipe. There are a few tricks for making gluten-free cake in general. For this reason I highly recommend using recipes that are designed specifically to be gluten-free rather than swapping in gluten-free flour for regular flour in a standard recipe. STEP 1: You start by beating together the eggs, white sugar and brown sugar. 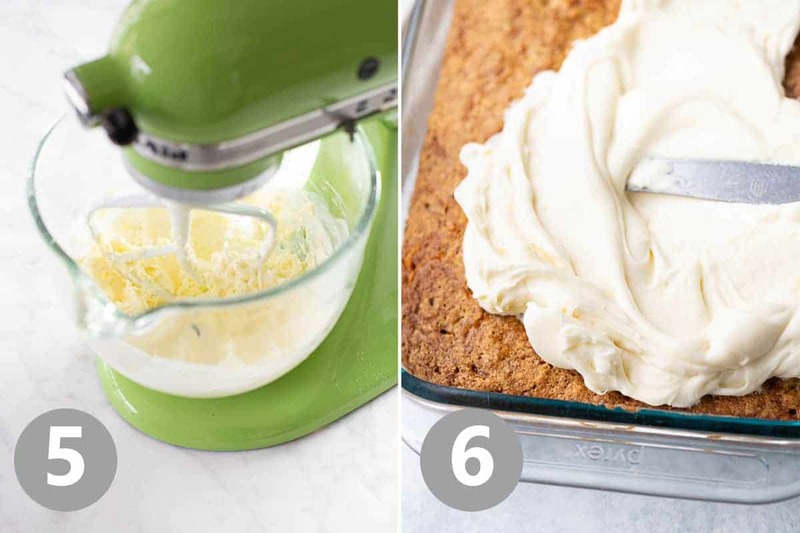 You can use a stand mixer or a hand mixer for this – either will work! STEP 2: Slowly add the oil in a steady stream while beating until fully incorporated. 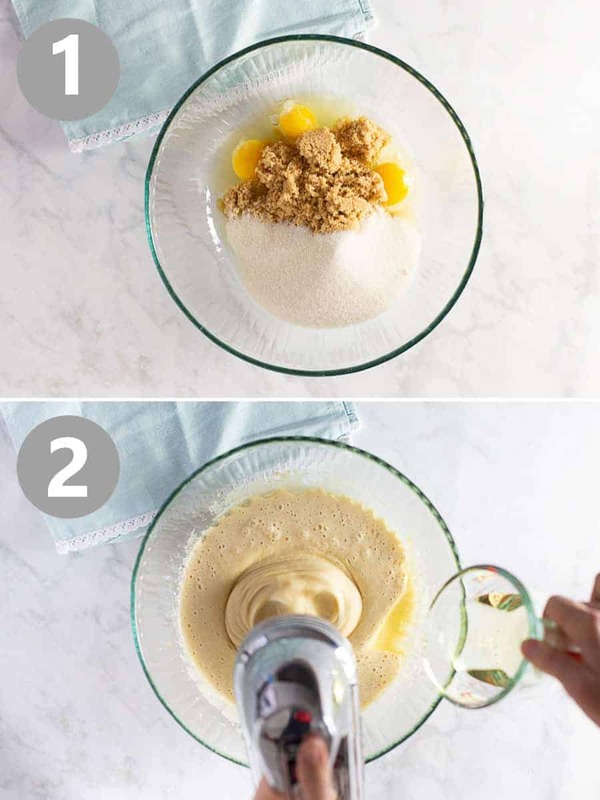 Then whip the whole mixer until light and fluffy, about 1-2 minutes. STEP 3: Add the dry ingredients, shredded carrots and pecans. I shred my carrots in the food processor to speed up the process. You can omit the pecans if you like but I love the little bit of texture! However if you ask me, pineapple has no place in a carrot cake! I like the nice light texture of a cake with no pineapple. STEP 4: Mix everything until incorporated then pour into a 9×13 pan. TIP: Shred carrots in the food processor to save time. STEP 5: Make the cream cheese frosting! This is my very favorite recipe for whipped cream cheese frosting. It really makes a difference to whip the ingredients together for a few minutes for a nice fluffy texture. I also like this cream cheese frosting because it isn’t overwhelmingly sweet. STEP 6: Spread the frosting on the cool cake. Refrigerate until serving if needed. Let the cake come to room temperature for about 20 minutes before serving. This recipe is perfectly designed to work as written with gluten-free flour. I highly recommend seeking out recipes that are specifically designed to be gluten-free. However, here are few tips for making cake gluten-free if you’re adapting a regular flour recipe. Use a high-quality gluten-free 1:1 flour: I like King Arthur Flour. I also usually reduce the amount of flour slightly as gluten-free flour tends to be denser than regular flour. Reduce the amount of oil slightly: Gluten-free flours aren’t as absorptive as regular flour so sometimes you need to cut back on the oil slightly. Add an extra egg: Eggs can give gluten-free baked goods an extra lift and needed structure. Bake the cake longer: Gluten-free cakes often need longer in the oven than regular cakes. Be sure to test the center with a toothpick to ensure it’s cooked through. Happy Baking! 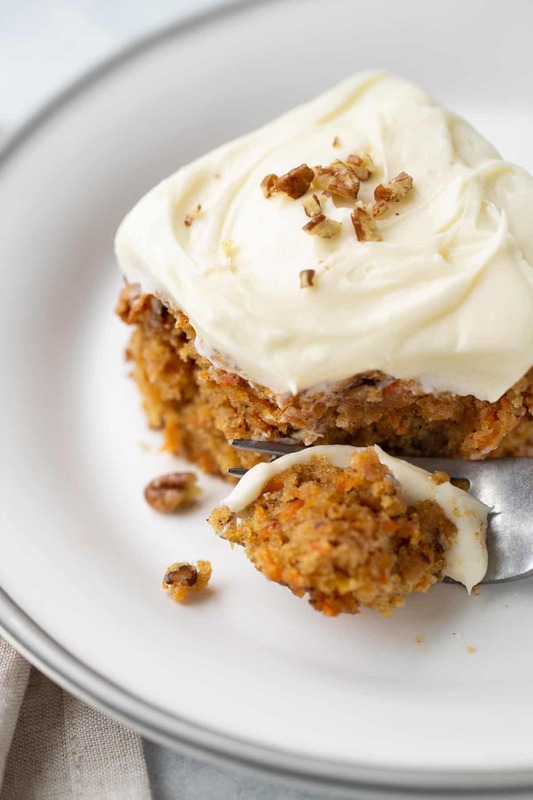 If you love this Gluten-Free Carrot Cake recipe leave a comment and rating below. Or hop over to instagram @meaningfuleats and say hello! 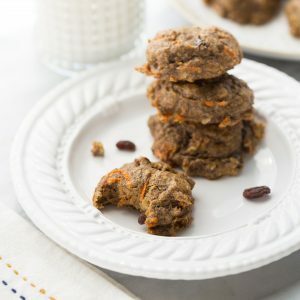 You will love this gluten-free carrot cake recipe! For the Cake: Preheat the oven to 350F. Spray a 9x13 pan with cooking spray and set aside. 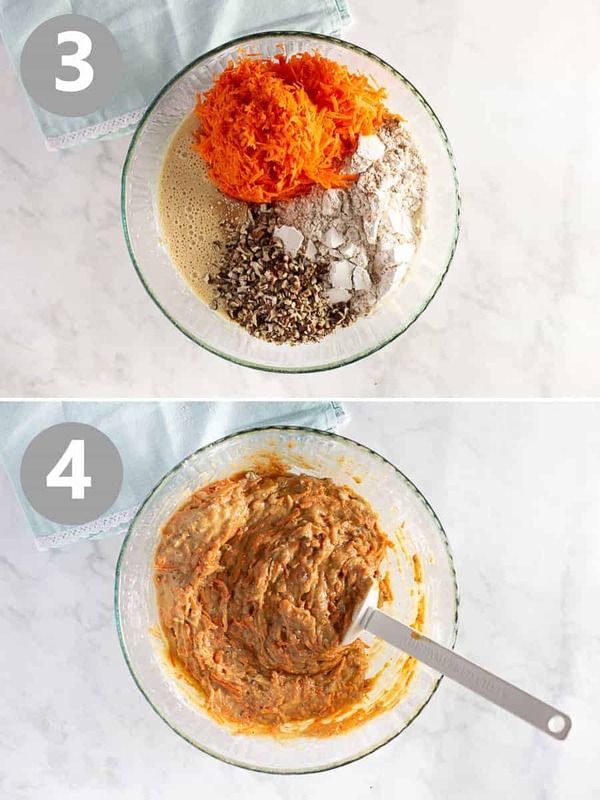 Grate the carrots in a food processor (this way is the easiest!) or by hand. In a medium bowl, add the flour, almond flour, baking powder, baking soda, cinnamon, nutmeg, cloves and salt. Whisk to combine. In a large bowl or bowl of a stand mixer, add the eggs, granulated sugar and brown sugar. Using a hand or stand mixer, beat until frothy and combined. Slowly pour in the oil while mixing and whip until light and fluffy, about 1-2 minutes. Add the flour mixture, carrots and nuts and mix everything together with a spatula until well-combined. Pour the mixture into the prepared pan and spread out evenly. Bake for 40-45 minutes until set and a toothpick inserted into the middle of the cake comes out clean. Let cool completely before frosting. For the Frosting: Mix the cream cheese, butter, sour cream, and vanilla at medium-high speed in the bowl of a stand mixer fitted with the paddle attachment (or in a large bowl using handheld mixer) until well combined, about 30 seconds, scraping down the bowl with rubber spatula as needed. Add the vanilla and powdered sugar and beat on low speed for 10-15 seconds, then increase the speed to medium-high and whip for 1-2 minutes until very fluffy. Spread the frosting over the cooled cake and top with more pecans if desired. Refrigerate until serving if needed. Let the cake come to room temperature for about 20 minutes before serving. Enjoy! MAKE IT NUT-FREE: Omit the almond flour and add 1/4 cup more gluten-free measure-for-measure flour instead. 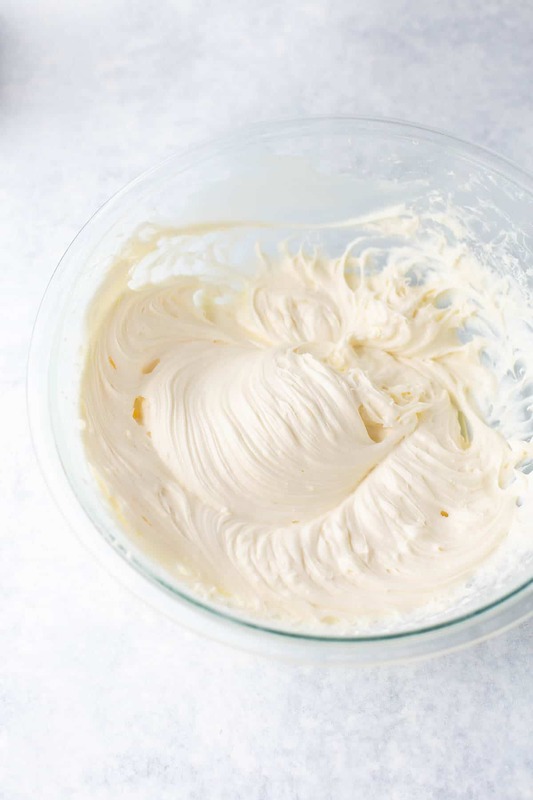 MAKE IT DAIRY-FREE: Make dairy-free cream cheese frosting. This recipe works great! 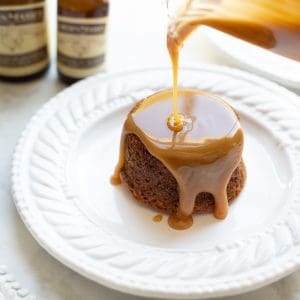 I haven’t made this yet, but I am so happy to find this recipe, and see that it does NOT include pineapple. I am with you there! My guess is that the almond flour measure is 1/2 “cup”, but you may want to clarify that. Thanks for sharing this. And now I am off to check out another recipe I see in the “related posts”. This is so moist and delicious…truly the best carrot cake! I am definitely going to be making it again and again especially for Easter every year! Thanks for the feedback. I am going to make this for Easter! Any luck with/attempts at replacing the egg? I enjoy scrolling through all your delicious recipes! Being gluten free AND dairy free, it’s often hard to find something I like and eating it too! Carrot Cake is one of my favs, it will definitely be on my Easter menu! Thank you! I can’t have cow dairy but can have goat dairy. Your carrot cake sounds amazing. Was wondering for the frosting if I could sub goat yogourt for the sour cream. Have subbed plain goat cheese logs for cream cheese and goat butter for reg butter before with great success. Looking forward to your response. Very excited to find your website. Just signed up.